Don’t want dirty water flowing into your tank as your clean your roof? 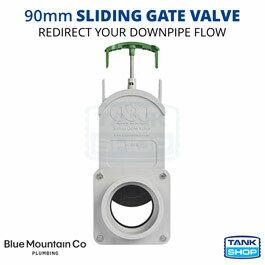 Simply close a valve in your downpipe. Located in a bushfire prone area? Protect your home as fire approaches by connecting a hose to your downpipe and filling your gutters with water. Have a pool? 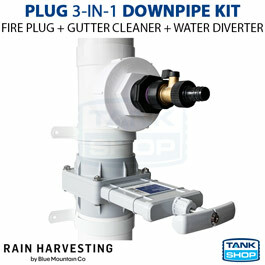 Top it up by redirecting rainwater to your pool. Tank Shop was FANTASTIC to deal with!!! I was VERY concerned about purchasing a tank online, so called the number numerous times and asked 1000 questions. The gentleman I spoke to was ALWAYS soooo lovely and understanding of my concerns. We went with it and had our tank delivered PERFECTLY on time, with ALL the attachments we needed to make it come together beautifully - SOOOOO happy. I recommend you to EVERYONE! THANKS SOOOOO MUCH! Very happy and pleased with service, reliability and generous assistance. Have recommended Tank Shop to friends already. Thank you, Scott, for a very good experience you provided for us, your generous assistance at any time, your reliability and very good service. Great product (Maelstrom), has made a big difference! I purchased a 5000l tank from the website. I had a follow up phone call that same day. Very happy with price and service received. Great prices, good service, fast delivery. What more can you ask for? Great price. Great service. Thank you for the prompt delivery. Will definitely use again. Great products and great service to back it up! Prompt friendly timely comprehensive service providing good value for money 5,000L tank. Easy ordering process and dealing with Scott was great. Ordered a pump on the Monday and was able to pick it up on Wednesday (waiting for bank transfer to clear).